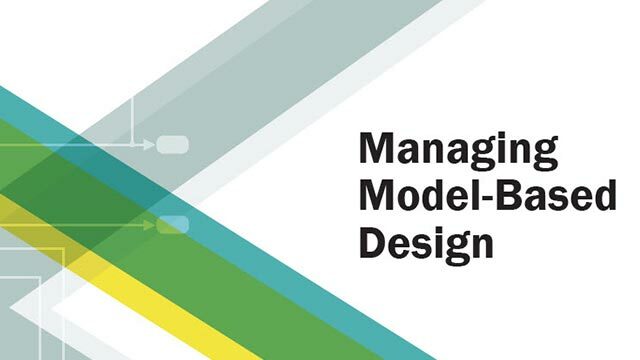 The top-level system layout of a Simulink®model is a common context that many engineering teams can use, and is the basis for many tasks in the Model-Based Design paradigm: Analysis, design, test, and implementation. You define a system at the top level by identifying the structure and individual components. You then organize your model in a hierarchical manner that corresponds to the components. Then you define interfaces for each component, and the connections between components. Linear — Both wheels turn in the same direction with the same speed, and the robot moves linearly. Rotational — The wheels turn in opposite directions with the same speed, and the robot rotates in place. Each type of motion starts from a resting state, that is, both rotational and linear speeds are zero. With these assumptions, linear and rotational motion components can be modeled separately for this introductory tutorial. The first modeling objective enables you to analyze the motion so you can design the sensor. The second objective enables you to test your design. Once you understand your modeling requirements, you can begin to identify the components of the system. Identifying individual components and their relationships within a top-level structure help build a potentially complex model systematically. You perform these steps outside Simulink before you begin building your model. What are the structural and functional components of the system? When a layout reflects the physical and functional structure, it helps to understand, build, communicate, and test the system. This becomes more important when parts of the system are to be implemented in the process. What are the inputs and outputs for each component? Draw a picture showing the connections between components. This picture leads to signal flow within the model, and, in addition to the source and sink of each signal, it helps determine if all necessary components exist. What level of detail is necessary? Include major parameters in your diagram. Creating a picture of the system can help you identify and model the parts that are essential to the behaviors you want to observe. Each component and parameter that contributes to the goal must have a representation in the model, but there is a tradeoff between complexity and readability. Modeling can be an iterative process: You can start with a high-level model with few details, and gradually increase complexity where required. What parts of the system need testing? What is the test data and success criteria? Which outputs are necessary for analysis and design tasks? 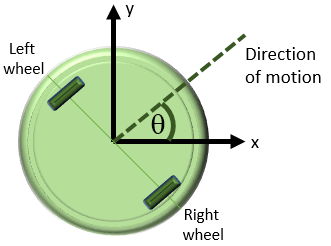 The model for this system includes two identical wheels, input forces applied to the wheels, rotational dynamics, coordinate transformation, and a sensor. The model uses a Subsystem to represent each component. Open a new Simulink model: Open New Model. From the Display menu, clear the Hide Automatic Names check box. Add Subsystem blocks. Drag five Subsystem blocks from the Ports & Subsystems library to the new model. Arrange and rename the Subsystem blocks as shown. Double-click a block name and type the new name. Identify input and output connections (for example, signal lines) between subsystems. Input and output values change dynamically during a simulation. Lines connecting blocks represent data transfer. The table below shows the inputs and outputs for each component. None No block necessary for modeling. Sensor dynamics is part of the design task. Input to the rotation computation — Subtract the velocities of the two wheels and divide by two. Input to the coordinate transformation — Average the velocities of the two wheels. Input to the sensor — Integrate the outputs of the coordinate transformation. The wheel velocities are always equal in magnitude and the computations are accurate within that assumption. Add necessary input and output ports to each subsystem. Double-click a Subsystem block. Each new Subsystem block contains one Inport (In1) and one Outport (Out1) block. These blocks define the signal interface with the next higher level in a model hierarchy. Each Inport block creates an input port on the Subsystem block, and each Outport block creates an output port. The model reflects the names of these blocks as the input/output port names. Add more blocks for additional input and output signals. On the Simulink Editor toolbar, click the Up to Parent button to return to the top level. When copying an Inport block to create a new one, you must use the Paste option. Compute required inputs from left wheel and right wheel velocities shown. Add an Add block from the Math Operations library and connect the outputs of the two-wheel components. Click the output port of the source block and then click the input port of the destination block. Add a Gain block and set the parameter to 1/2. Compute the Linear speed input to the Coordinate Transform subsystem, connect the output of the Add block to this Gain block. Add a Subtract block from the Math Operations library and connect the outputs of the two-wheel components. Add a Gain block and set the parameter to 1/2. Compute the Speed difference input to the Rotation subsystem, connect the output of the Subtract block to this Gain block. Compute X and Y coordinates from the X and Y velocities. Add two Integrator blocks from the Continuous library and connect the outputs of the Coordinate Transform block. Leave initial conditions to the Integrator blocks as 0. Complete the connections for the system as shown. Determine the parameters that are part of the model and their values. Use modeling goals to determine whether these values are always fixed or change from simulation to simulation. Parameters that contribute to the modeling goal require explicit representation in the model. This table helps determine the level of detail when modeling each component.